I hope you're all well. Today i made this beautiful card. I love the smell of Lavender. It makes me feel so calm and collected. My in laws bought me a gorgeous lavender plant for my garden and as soon as you go out in to the garden you can smell it. Its gorgeous. This card has been made for my grandmas birthday. She also loves lavender. I think the purple and gold complements each other very well. I added a lovely doily to the card and then stuck the topper over the top. 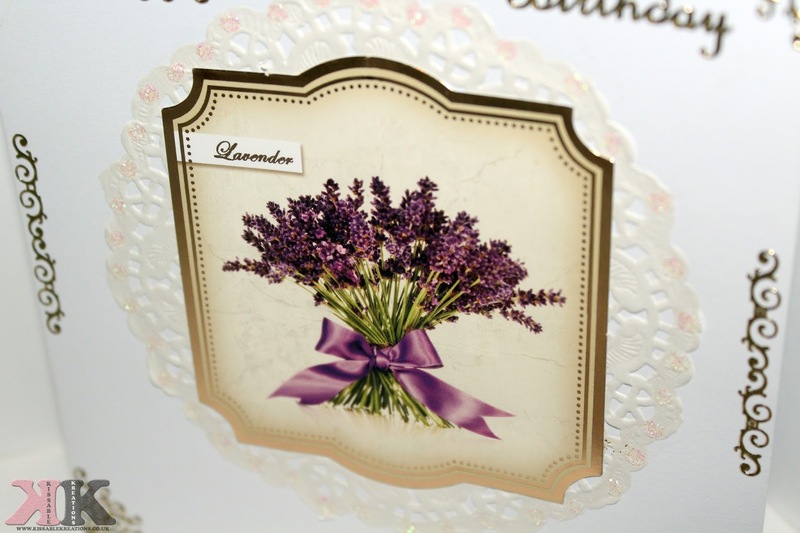 I also added some glitter drops on the outside of the doily but the photograph just doesnt do this card justice. The boarders are just peel offs that i had lying about. They just finish the card off nicely. This card is beautiful! I love lavender, but tulips have to be my favourite flower! I would love you to link up some of your crafts to #MakeItLinky if you fancy it? That's probably one of the best looking cards I've seen! And the crafting behind it look so well done and meticulous! Nice one! Ah so pretty! I love lavender too, it is so soothing!